Come check out some of our current Service Specials! Our service department has the most experienced and qualified technicians around, certified to work on vehicles from any manufacturer in the motorsport industry. Between our service team and service equipment, we can tackle almost any ATV, UTV, watercraft, scooter, and motorcycle. The All Out Powersports service team does everything from exhaust and tuning to suspension work. We do it all! Need scheduled maintenance? Not a problem! Come in and a service specialist will take care of you. Has your vehicle been sitting a while? Does it need the seasonal service it deserves? Our service team will get everything running flawlessly for the upcoming season. Got a flat tire? 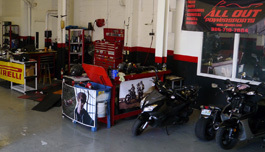 All Out Powersports can do one the fastest motorcycle tire change jobs in Daytona Beach. Does your motorcycle, ATV or UTV need some extra power? Come in and talk to our Performance Specialists today! Our Performance Expert will get your ATV or UTV running at its peak in no time. Shop Hours: Monday - Friday: 9a.m.-6p.m. Saturday: 9a.m.-5p.m.